Inspired by Remix's video, I created a chart showing the grounded actionable ledge intangibility (galint) resulting from a ledgedash performed with various fall and jump frames. These tables show the resulting intangibility after various ledgedash timings. Each table represents a different setup for the ledgedash because pre-ledgegrab body states affect your ledgedash timing, as well as whether you fastfall or not. Red cells represent an SD. 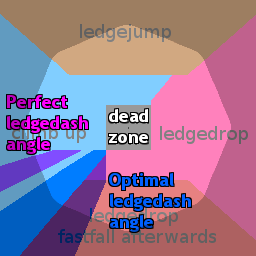 Blue cells represent ledgedashes that require very precise angles that I figure are not worth attempting. The rows and column show the numbers that would appear with Achilles's 20XX frame counter set to those action states. They start counting from 0 each. The 2 column for Jump Frames represents 3 frames of jumping. The 3 row for Fall Frames represents 4 frames of falling. These numbers were found using a 70% analog jump forward and an airdodge down forward at a 45 degree angle. This method was chosen for ease and consistency as explained in Remix's video, as well as it being endorsed by Kadano. The exact numbers could be different in any instance by + or - 1 if the airdodge angle is steeper or shallower. Shallower angles may result in more frames in the airdodge animation subtracting from your galint. The top two tables show intangibility with frames of fastfall. Note that the first frame falling from the ledge can never be a fastfall so the first rows of every table are identical. The bottom two tables show intangibility without fastfalling. This keeps Falco much higher allowing him to have more fall frames without SDing. It also keeps him higher meaning he often has to spend more frames in airdodge when you have excess jump frames. This takes away from your galint. The left two tables show the resulting galint after Falco grabs the ledge either a firebird ledgestall, sweetspot side-b, or a down angled sweetspot up-b. The right two tables show the resultin galint after grabbing the ledge from a sweetspot double jump. This method keeps Falco's ECB the highest and allows for the fastest possible ledgedash, but also subtracts from galint when he spends more frames in jump. Important: if Falco grabs the ledge from (almost) any state not listed, in particular an up-b from below the stage, his ECB will extend very far down making it very easy to SD with regular ledgedash timings. I would recommend only ledgedashing after grabbing the ledge in one of the ways listed in the first two sentences of this paragraph. Now to the main point of making these tables. We can choose a 2x2 grid that yields sufficient galint and also grants us some flexibility in terms of execution. I think what is best to shoot for is the bottom left table, grabbing the ledge after a firebird ledgestall, sweetspot side-b, or a down angled sweetspot up-b. In that table, the best 2x2 grid would be the intersection of rows 0,1 and columns 3,4. If we do get the fastfall, there is a 50% chance of SDing. However, avoiding the fastfall is simple enough. To avoid the fastfall, move the stick down and the the left/right in an slow arcing motion. In actuality, the stick can pass through the red zone. All that is required is that the stick be in the pink ledgedrop zone for at least 2 frames before entering the red zone. Once you jump, you can move the stick into the red zone. This motion is somewhat similar to the slow tilt method for shield dropping. Quickly pushing the stick to the bottom right/left notch will always result in a fastfall ledgedrop. With the methods described above, you can ledgedash and expect at least 10 frames of galint. This is sufficient intangibility for an intangible grab, dtilt, turn around utilt, SH nair, SH dair, ftilt, jab, shine, smashturn jump bair, usmash, and probably something else I forgot. I saw this very similar spreadsheet for fox and was just trying to match it with Falco to get my own ledgedashes crisp. Thank you for this! Could you also drop it in the Melee Library under Falco? Will do the next time I update it.